On February 21st, New York district attorney Cyrus R. Vance Jr. issued four indictments charging at least 17 people and 19 companies in New York with conspiracy and corruption with respect to illegally controlling the list that police officers rely on to call towing companies in response to vehicle collisions. 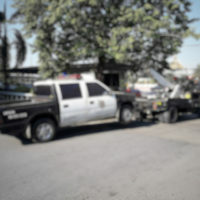 According to the criminal indictments, the defendants came to dominate the business by purchasing various other towing companies and then using those licenses to stay at the top of the rotating list. Allegedly, their bookkeeper helped to conceal the activity from the Department of Consumer Affairs. While the companies all had different names, logos, and listed owners, they were all allegedly “fronts” and “shell companies” for the Steininger Enterprise. Vance also alleges that the company listened in on police radios in order to gain an advantage in getting to crash scenes sites first (a practice known as “chasing”) and that they used various bullying and harassment techniques–such as “blasting” (where you strike a competitor’s truck with a crane to send a warning) and putting on a “show of force”–in order to beat out the competition. Vance has also accused Steininger of stealing hundreds of thousands of dollars from insurance companies via filing fraudulent claims and purposely damaging some vehicles in order to get additional funds for “damage enhancement.” Steininger has also been accused of maxing out claims and billing insurers for work not performed. In response to allegations of collusion, Steininger has put forth the defense that there was no criminal collusion, simply normal, free market enterprise activity regarding the businesses that were purchased by his company. In other words, he argues that the fact that a monopoly existed simply resulted from Steininger being successful in the market, where no competitor could match his services or invest enough to purchase other towing companies in order to gain an advantage. If Steininger didn’t pay for trade secrets or pay other companies to stay out of the market altogether, then he has a viable defense to argue that he operated within what the law allowed for in terms of his other companies. One thing is clear: New York district attorney Vance is taking activities like these seriously, especially since towing is one of those services in New York that can be exceedingly lucrative. If you have been accused of collusion, corruption, or conspiracy, you should speak with criminal defense attorney Phillip J. Murphy right away. We have been serving New York communities for more than 25 years. Contact us today for a free consultation to find out more.